The name of Dr. Henry Heimlich, for whom the choking first-aid maneuver is named, is known worldwide. But recent news coverage questions what his legacy will be. The Atlantic notes that the world "may not remember him at all, as 'abdominal thrust' is now the term of choice of the Red Cross and the American Heart Association for the life-saving response to choking victims." ...As the Atlantic reported, Heimlich "wasn't content just to be a household name" after he introduced the Heimlich Maneuver in 1974. He began promoting it for asthma attacks and drowning victims. Then he began running experiments in developing countries to see if inducing malaria in AIDS patients could cure them. Radiolab's Pat Walters recently devoted a podcast to Heimlich, whose move once saved his life. Though he was once a big fan of Heimlich, he didn't like what he found. "When I think about my kids...when they learn this thing, it won't be called the Heimlich maneuver," he said. "And based on what I know now, I really don't think that I would tell them to call it that." Sometime over the next few days, the story was completely scrubbed from the site without any published explanation. 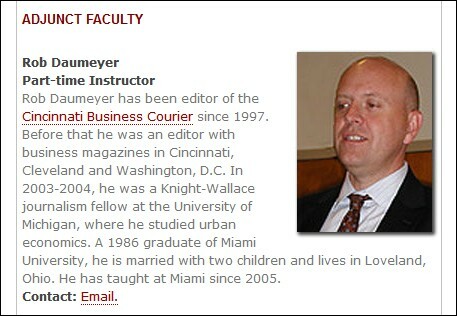 And the paper's long-time editor -- and part-time journalism teacher at Ohio's Miami University -- Rob Daumeyer, is refusing to answer questions. So why did Ritchie's story get censored and who gave the order? 1) I'd like a yes or no answer re: whether anyone from Deaconess* or the Heimlich Institute or anyone representing my father contacted the paper about your item. 2) If yes, may I please be provided with the name(s)? 3) I'd like to know the precise time your item was taken offline, which Business Courier employee was responsible for the decision to take it offline, and why it was taken down. I'd welcome any additional information the Business Courier wishes to provide. Peter ... 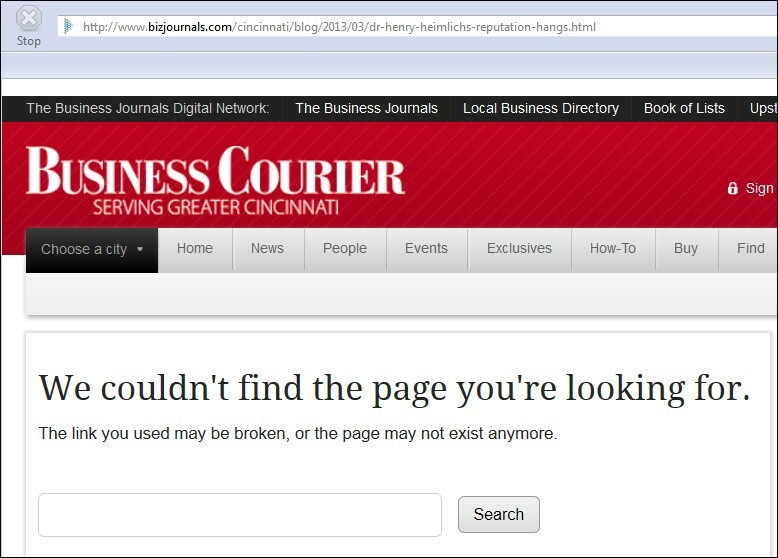 This is Rob Daumeyer, I'm editor at the Business Courier ... I don't have any additional information to add for you. Hat tip to Bwannah Bob. This item has been slightly revised and updated.